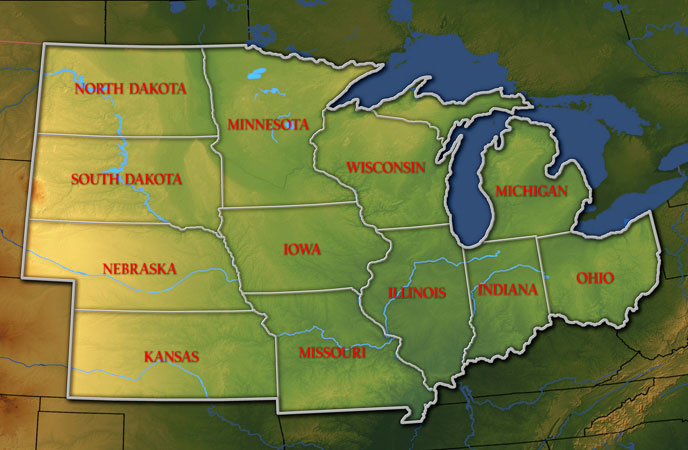 Since our magazine debuted over 21 years ago, Midwest Today has served, informed and entertained millions of travelers from hundreds of cities, becoming a widely recognized and trusted resource to a multitude of sophisticated consumers. We recognize that Heartlanders are interested in more than just recipes or decorating tips. Our editorial focus is such that that we have substantive, timely content to take readers cover-to-cover, with features that are really relevant to your lifestyle. We are a magazine for readers, NOT browsers. We are not designed to be merely glanced at and tossed aside. We feature writing worth reading...and repeating. You get more exposures because readers spend more time with each issue of Midwest Today. Our lively editorial informs and entertains. Studies show that ads which perform best appear in an editorial environment that preconditions readers to action. Through subscriptions and direct placement in the rooms of upscale hotels/motels, Midwest Today gives you direct access to a vast audience of affluent Heartlanders at a fraction of what others charge. As a value-added bonus, your ad also appears FREE in our �exact replica� Digital Edition with a link embedded in your ad to drive traffic to your site. And we are now available to thousands of bonus readers on mobile devices like the iPad, Google Reader and smart phones, with our new interactive ap that can display your ad in the context of our magazine and can take people directly to you with a touch of their screen! And we promote our magazine (and your ad) on our slick weekly show, the �Midwest Today Radio Edition,� heard on 52 stations region-wide. We are unique in offering a COMBO of print, broadcast, web* and mobile exposure that no other single source can give you. And you can get in our magazine for as little as $310! We have a unique 70/30 editorial-to-advertising ratio (meaning you won't get lost amidst clutter), and you'll be impressed by our low CPM. 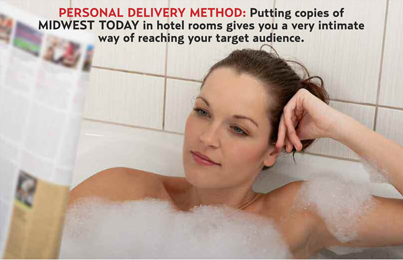 By placing copies directly in the rooms of numerous upscale hotels/motels, we dramatically boost our readers-per-copy. Independent studies by the hospitality industry show that in-room magazines are typically read by 10-13 readers per copy (due to the turnover of the rooms) � far outpacing magazines that are merely mailed to subscribers and may languish unread. The housekeeping staffs continue to replenish copies as needed so your ad remains on continuous display during the entire 3 month cycle between our issues. This gives you more selling time and a low duplication rate. There is a common misconception that the advent of smart phones, Facebook, Twitter and the myriad of electronic media has replaced print. That may be true for newspapers (whose daily news coverage is stale by the time it arrives at your door � hence circulation has plummeted). But this is NOT true for magazines, which offer a different style of writing, which studies show people stick with and read in a more leisurely frame of mind. As you put together your ad budget and try to figure out how to stretch your scarce ad dollars the farthest, we strongly urge you to take a moment to read some surprising stats about why magazines are a superior and efficient method for getting your message to the right people. Click HERE to read the facts. And we invite you to download our Media Kit (by clicking the link in the black box below), and giving us a call so we can chat about how Midwest Today can help you reach your ideal demographic for pennies per inquiry. *For a profile of Midwest Today's online audience that you also reach by virtue of your print ad appearing FREE in our �exact replica� Digital Edition, Click HERE. Copyright 2013 by Midwest Today. All rights reserved.